Sergeant Ross Wellesley Lindeman served in the Royal Australian Air Force. While flying with 153 Squadron, he died on 25th January 1942 in Co. Londonderry. Royal Australian Air Force Sergeant Ross Wellesley Lindeman died shorty after taking off in a Boulton Paul Defiant from RAF Eglinton, Co. Londonderry. Sergeant Ross Wellesley Lindeman (493141) served in the Royal Australian Air Force during World War Two. Born on 4th January 1920, he was the son of Frederick Harold Lindeman and Hilda Maud Lindeman (née Mullens) of Edgecliff, New South Wales, Australia. He enlisted on 9th December 1940. He completed training as a cadet on 22nd April 1941 and left Sydney, Australia for Vancouver, Canada on 14th May 1941. On 23rd July 1941, he graduated from No. 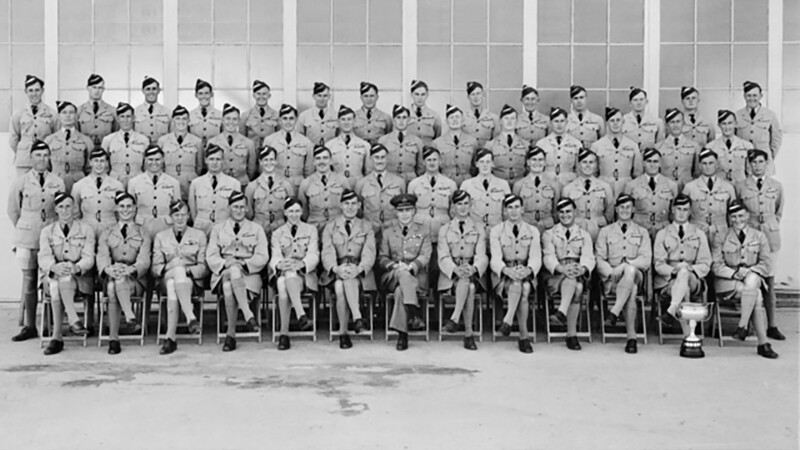 11 Service Flying Training School at Yorkton, Saskatchewan, Canada. He flew De Havilland Tiger Moths and North American Harvards. After leaving Canada on 9th August 1941, he travelled to England and joined RAF 153 Squadron on 31st August 1941. Australian War Memorial Photo: P03758.001. Group portrait of Royal Australian Air Force graduates from No. 9 Course at 5 Elementary Flying Training School, Narromine New South Wales. About a third of these men died during World War Two including Sergeant Ross Wellesley Lindeman. Copyright unknown. During the Second World War, Lindeman flew with the Royal Air Force. He died on 25th January 1942 aged 21 years old while attached to RAF 153 Squadron. He was the pilot of Boulton Paul Defiant N1647. The Mark I plane took off from RAF Eglinton, Derry, Co. Londonderry on a return journey to RAF Ballyhalbert, Co. Down. Pre-flight tests found no issued with the plane and weather conditions were fair with excellent visibility and a gusty wind. Immediately after taking off, the plane made a steep turn and flipped over on its back. At such a low height, there was not enough time for Lindeman to regain control and the Defiant dived into the ground. Both men on board died in the crash. Lindeman Ross Wellesley Sergeant Pilot RAAF 493141. Killed. Low Robert Sergeant Air Gunner RAF 817273. Killed. Ross Wellesley Lindeman’s grave is in Grave 2 of St. Andrew’s Church of Ireland Churchyard, Ballyhalbert, Co. Down. A funeral took place on 29th January 1941. His name is on panel 125 of the Commemorative Area of the Australian War Memorial, Canberra, Australia. If you enjoyed this post on "Ross Wellesley Lindeman", please share with your friends and followers.